At the beginning of the academic year we had the privilege of returning to Mount Carmel Secondary School in the Dublin’s North Inner city for the third year in a row. We love working with the students and teachers from this school; we are thankful for the relationship we have built there. This year we had the bonus of two transition year classes instead of just one and it was all systems go as we set out for another 10 weeks of developing young leaders. The two classes worked well and within each one we began to see the development of ideas which would positively influence their local communities. 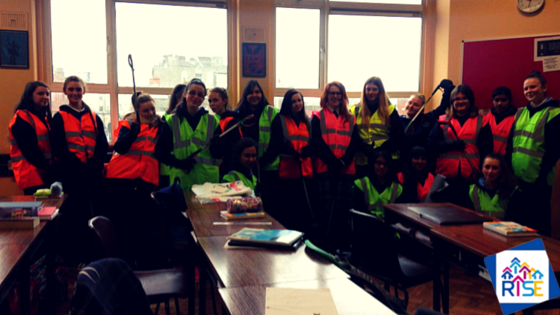 The first class decided upon a community clean-up and the second class chose to visit an elderly care home. We love seeing how teenagers can develop a passion for bringing change to the problems they see around them. Being able to equip and empower them to move into action is one of the most exciting parts of RISE. While the community initiative project is the end of the RISE Leadership Programme, it is not the end of a students’ RISE journey. At the end of the 10 weeks, we offer anyone who wants to be part of our six week RISE Mentoring Programme. Mentoring allows for further development of a young persons’ school or community engagement. We were delighted that after working with two classes last term, we have 5 students who want to be part of mentoring after Easter. This one-to-one programme enables us to dig deeper into the leadership goals and dreams that a young person has. We work alongside them as they work out a plan to reach and achieve these goals. It is an exciting time as we begin mentoring these teens in the next two weeks. 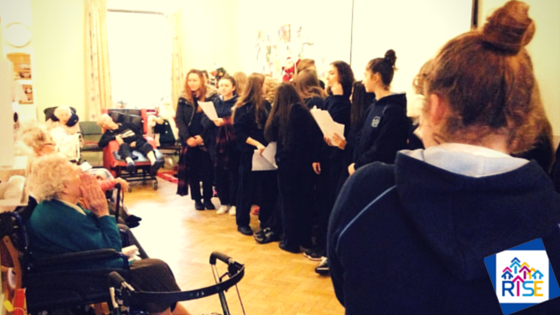 Watch this space for more stories of teenagers bringing hope to inner city Dublin. March 7, 2016 in Leadership, RISE, Uncategorized.